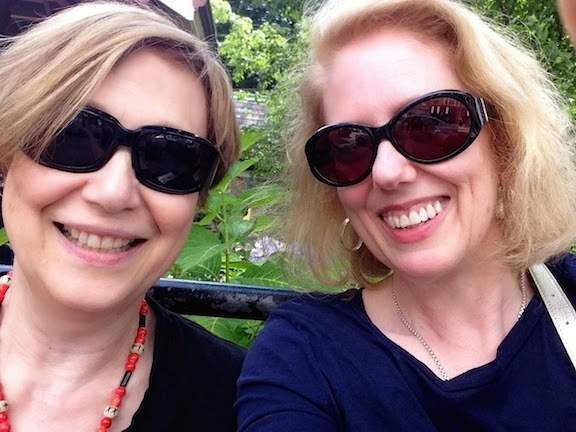 Two Nerdy History Girls: Ahoy! Real-Live Petticoat Breeches! Colonial Williamsburg is land-locked in the Virginia Tidewater, so imagine my surprise this morning to meet this handsome young 18th c. sailor strolling the streets of the town. (He's really CW interpreter Beau Andrews.) 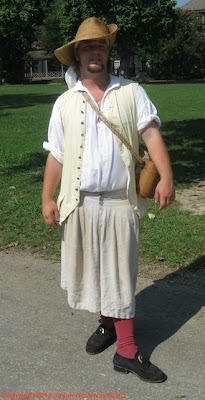 His shirt, straw hat, and waistcoat are standard attire for any man of the time regardless of his class, but what instantly caught my eye - and what identified him to me as a sailor - were his linen petticoat breeches, the first I'd ever actually encountered outside of a painting or print. One of my very first posts for this blog - way back in 2009! - was about petticoat breeches. While this fashionable affectation for gentlemen and courtiers didn't last long in the second half of the 17th c., it did continue for working sailors long into the 18th c. It was a practical style: the wide legs offered plenty of room for movement and could be easily rolled up higher on the leg if necessary, and the loose fit dried quickly. While breeches as wide as these gradually narrowed with the 19th c., loose-legged trousers continued to be standard attire for working sailors, and remain so today. Just right in this hot weather! Williamsburg may not be on an ocean, but in the period they've recreated for the Colonial displays, the York and James were both heavily in use as sailing channels. Richmond and Williamsburg both played host to thriving sailing activity and would have seen many sailors.